Johanna Weinstein is a title designer, food stylist, and artist based in Toronto. 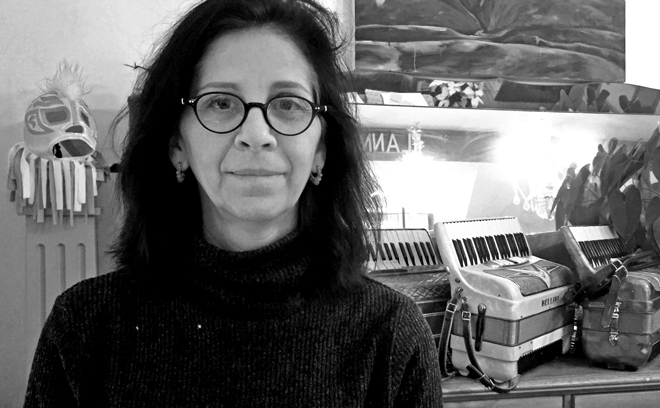 She is a graduate of the Graphic Design program at George Brown College and has been working in design for more than 20 years, creating graphics and title sequences for feature films and TV series. Johanna’s feature film work includes the title sequences for The January Man, I Love a Man in Uniform, Joe’s So Mean to Josephine, Long Day’s Journey Into Night, Foolproof, and The Bang Bang Club. For Director Atom Egoyan, she has designed the title sequences for Felicia’s Journey, Ararat, Where the Truth Lies, Adoration, and Chloe. For television, she has designed the title sequences for Slings and Arrows and Jeff Ltd. She also directed the short My Boyfriend’s Package which was included in the anthology film Little Films About Big Moments, released in 2010. Johanna has also done corporate design for Roots Canada, The Toronto International Film Festival, The Canadian Film Centre. Now a trained chef, she has designed food for movies and television as a food stylist. She has hosted a cooking show on Global TV and co-wrote a cookbook, By My Side, that was published by Penguin Canada. She continues to work on various projects in the Toronto area.